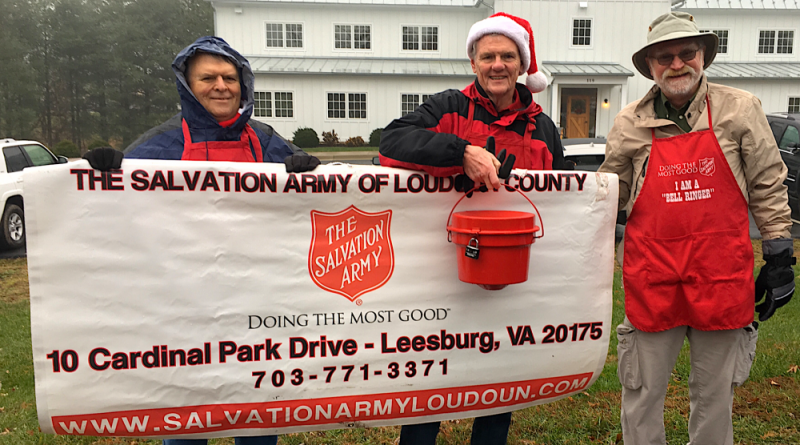 For the 10th consecutive year, Salvation Army of Loudoun County representatives called out Christmas greetings to and collected donations from the visitors along the route of the Middleburg Christmas Parade on Saturday. While cold, rainy weather resulted in smaller than typical crowd sizes, this year’s donation buckets felt heavier than previous years’ buckets, stated Ric Humphreys. That was a good sign during a Red Kettle giving season that, so far, has seen fewer donations and fewer volunteers in Loudoun. During the first four days, donations for this year were only 50 percent of 2017. One obvious cause is that fewer people have volunteered to ring the Red Kettles’ bells, organizers said. “Our Salvation Army needs your bell-ringing help to attain its needed goal of $95,000 for Red Kettle donations. They account for one-third of our Salvation Army’s annual budget needs,” stated Captain Pradeep Ramaji. To sign up as a bell ringer at a location of your choosing, click here. For more information, call 703-771-3371 or go to virginiasalvationarmy.org/loudouncountyvacorps. Salvation Army representatives also will be walking and collecting donations during the Leesburg Christmas Parade on Saturday evening.